Today has been good. Good for my God in His work in me and I know it. Praise Him! I woke this morning two hours before my Bible final and spent time in the Word before making breakfast. 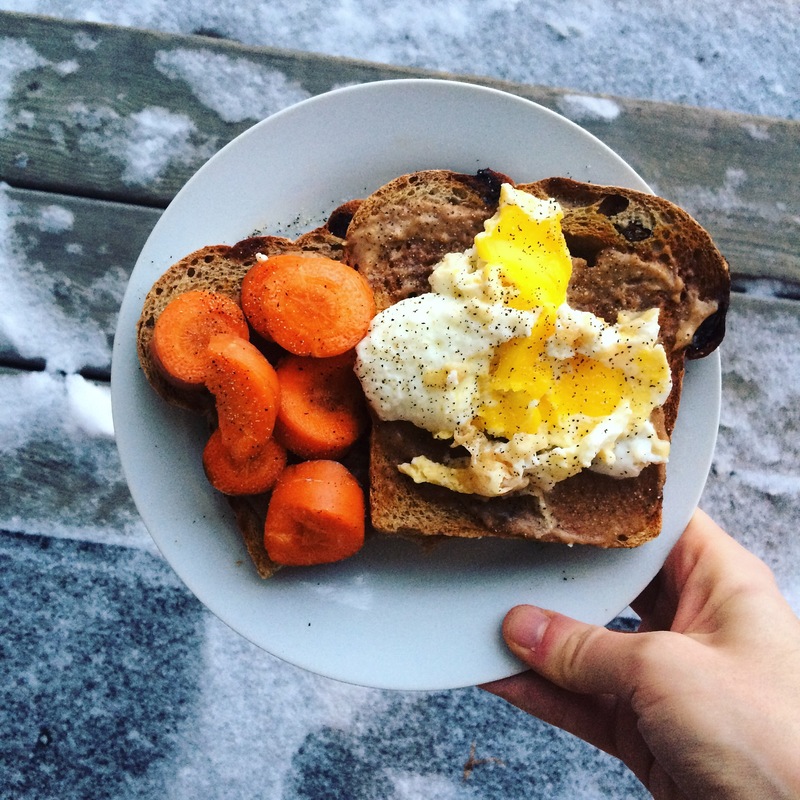 I brewed coffee and made 2 pieces raisin toast with carrots, peanut butter, and an egg. It may seem like an uber random hodge podge but it was really good. And while I was making it I was struck with such thankfulness and joy, as I have been feeling so strongly lately, in this house. Ahhh praise the Lord! My Bible final went really well. I had a one on one oral presentation on an entire timeline of the Bible, and I must say that I learned more valuable and life-taking things in this class than in any other academic class in the history of my life! My prof is a wonderful human being, too. After the final, I headed straight to a study lounge and plugged away for hours on my final paper for my other Christian Studies class. I finished it, and edited it a few hours later. DONE! I headed out around 1pm to get my blood work and heart test as per my doctor’s request. I used to get these done once a month at the ed clinic. Today, being there and getting them done, I felt so convicted in the way the illness has taken over parts of my soul that are for Jesus alone. It was a major wake-up call just being there, backward-prophetic in it reminding me of how unfruitful that consumed life was– therefore, not even a pinch of this disorder may consume my mind. So I went home in prayer and, by the Spirit, determination to eat a good lunch. And it was yum! I made a beef steakette with whole grain rice, green beans, carrots, and my homemade Thai sauce. It was really good!!! I hung out and caught up with Maddie and Mary in the living room for a bit before we all went to a cafe to study. Again, hit with nostalgia and blessings. So blessed. We studied well for a few hours, I caught up on errands and cleaning and before I knew it, it was late! I made dinner of my favourite chicken breast with a giant bowl of goat’s yogurt, peanut butter, and carrots. Again, I am such a random eater… but I genuinely love these foods and just wanted something quick and easy. I had a lovely coffee catch up with my beautiful friend Emily, and Mary joined us too, which was great. I drank a soy cappuccino, as is typical. Mary and I had a music-blasting cleaning party and I look disgusting right now but I so don’t care! Two more exams, Johnny’s birthday in five minutes, and I am seeing him on Friday. I have endless reason every moment to praise my God and more need each second to repent as I am called.